Remember a while back when I shared my Hot Chocolate Bar with you? I mentioned that it was part of a Season's Cleanings challenge from Home Depot and P&G. 10 bloggers (including me) all created projects for the challenge, and right now you can vote for your favorite. The winning blogger gets a $1000 gift card...and the voters have a chance to win something too. *One grand prize winner will receive a $5,000 Home Depot gift card, a P&G product prize pack and a $500 Merry Maids gift card. 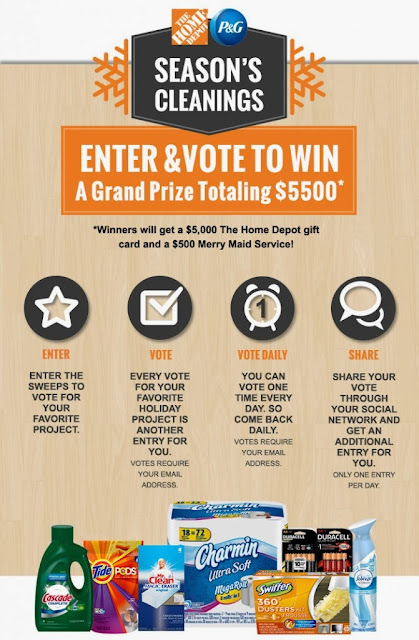 *FIVE runner’s up will receive a $500 Home Depot gift card. So make sure and head over here and vote for my hot chocolate bar! You might be able to win big too! Hmmm, I tried a couple of times to enter and the screen totally froze up on me, couldn't get it to do anything after entering my name, address and email address. Oh well.